According to the Governor of Papua, a draft law on governance in Papua (RUU) is now being considered by the Minister of the Interior. The draft law will be formally ratified in August 2014. There have been many complaints by Papuans about this draft because of the lack of transparency, down to the substance, article by article, which only complies with the political interests of the political leaders and will not meet the basic needs of the Papuan people. Very few people know anything about this draft. The most striking thing about it is that as compared to Law 21/20012 on Special Autonomy for Papua there are a number of articles that are quite different from this law. Whereas Law 21/2001 consists of 24 sections and 79 articles, the draft law now under consideration consists of 51 sections and 369 articles. There are far more articles but a careful look at the draft reveals that it is only about financial matters which will greatly increase the revenue for the Province of Papua; there are no articles dealing with the rights and dignity of the Papuan people. This new law will add nothing of substance to the previous law. Some of the articles are the same as those in the previous law. Moreover, in the twelve and a half years since the earlier law was enacted, nothing has been done to implement the law. Take for example Section 35, Article 297 regarding the establishment of a Commission for Truth and Reconciliation (CTR). Article 297, third para, states that the function of the CTR is (a) to clarify the history of Papua to reinforce unity within the Unitary State of the Republic of Indonesia (NKRI), (b) to draw up and lay down the steps to be taken for reconciliation. There is no difference between this and Article 46 of Law 21/2001. For twelve and a half years, nothing has been done to implement these articles which seem to have been completely forgotten. The Jakarta government has done absolutely nothing about reconciliation. Everything that the government has done is only about money ... money ... and money. The Special Autonomy law for Papua is not just about money, affirmation for the Papuans, economic development or welfare. It deals with the need to heal the wounds that have been inflicted which should be done by means of reconciliation. There are two points regarding the tasks of the CTR which are contained in the Special Autonomy Law as well as in the draft of the law now under consideration. The first is the need for the rectification of history and the second is deciding on the steps to be taken for reconciliation. To this day, the Indonesian Government had said virtually nothing about reconciliation, either with regard to the general situation in Indonesia (the many victims of human rights violations during the New Order era) or with regard to the situation in Papua. The Papuan people have continued to call for dialogue between Jakarta and Papua as one of the moves towards reconciliation. Two years ago, the President of Indonesia spoke about his readiness to enter into dialogue as long as this was within the framework of the NKRI but to this day, nothing more had been said about this. The Indonesian Government has chosen to deal only with the issue of welfare. Conflict resolution expert John Burton says that identity conflicts are rooted in needs which can no longer be negotiated, because identity is a basic need, is rooted in the past, and is sometimes difficult to resolve. This theory of Burton maintains that identity is a basic human need which is a critical element in the fulfilment of welfare. This analysis stresses the need to deal with this only regarding the present and the future but barely mentions the problem of dealing with the past. We have all forgotten that Law 21/2001 on Special Autonomy (Otsus) came about as a product of reconciliation. This law was enacted because of the publication of information about the gross human rights violations in Papua which occurred during the period of reformasi in Indonesia (following the end of the Soeharto era in May 1998). This was followed by huge demonstrations organised by students as well as by the Papuan people demanding a referendum about Papua's future. These demonstrations reached their zenith after one hundred Papuans appeared before (President) B.J. Habibie and demanded that Papua should secede from Indonesia. Briefly, the granting of Otsus led to the upgrading of APBD (regional budget) for the Province of Papua and all the district and city administrations throughout in Papua because the Papuan people were demanding freedom from Indonesia. It was Gus Dur (Abdul Rahman Wahid) who offered special autonomy and reconciliation as a halfway measure for Papua, which the Papuan people were prepared to accept. But then what happened was that these that moves in favour of reconciliation were replaced by actions to improve the welfare of the Papuan people without any discussion taking place about ensuring that the reconciliation offered would be genuine. Ok, if Jakarta is not ready to consider revising its view about the straightening of history using the theory of John Burton to resolve the Papua problem, then actually there are some small things which Jakarta could do for Papuan people to heal some of the wounds because of the many human rights violations they have experienced in the past. This would pave the way for a process of mutual understanding. First of all, all Papuan political detainees should be unconditionally released as part of the process of reconciliation. Secondly, scholarships should be given to the children of all political prisoners as an act of reconciliation for these children who have encountered many problems as a result of their parents having been arrested or killed. Thirdly, end the practise of using the OPM stigma towards Papuans who are critical of the government. And finally treat them in the same way as Indonesians who are critical of the government are treated. So why are political prisoners, their children and the topic of stigma important? 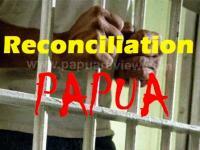 Because political prisoners and their children are direct victims of the conflict in Papua. They are the ones who called for independence, which resulted in the enactment of the Special Autonomy Law. So they are the ones who should enjoy the benefits of special autonomy; there must be a reconciliation with these people. Then there is stigma. Stigma is any label which can easily be applied to anyone who criticises the government. The ease of stigmatisation means that social control in Papua is very low, corruption is rampant and poverty in Papua has actually increased during the Special Autonomy era. According to Bar-Tal (2000), reconciliation must include several important psychological factors, that is to say, transforming beliefs and attitudes in favour of support for peace and the need for peaceful relations between the two parties. Bar-Tal stressed the need for a change in ethos on both sides, that is to say, the atmosphere of conflict should be replaced by a peaceful atmosphere. This is only possible if there is a change in beliefs at the community level. The Papuan people have very little confidence in the government. No one should be surprised to hear that all the development policies in Papua are rejected, and this really obstructs efforts to develop Papua, let alone to improve the welfare of Papuans. Psychological change at the community level is very important if we want to talk about welfare. Welfare is not just about material conditions but also relates to psychological attitudes as well. My suggestion is that small steps need to the taken by Jakarta as a sign of goodwill in efforts towards reconciliation, without needing to straighten history, but some actions have to be clearly felt by the Papuan people. This does not include the issue of history but actions that would clearly be felt by Papuans. Such an effort only requires good will and the ability to effect the healing of the Papuan people. Goodwill may well meet with scepticism and it is not certain that it will be accepted. These suggestions may well be seen with a certain amount of scepticism. Even so, it is essential for Jakarta to take action in favour of reconciliation as a clear sign of the goodwill of the government, because the Papuan people have been actively pressing for reconciliation by means of a dialogue between Jakarta and Papua.